Everyone needs fresh water to live, but fresh water is limited and precious. Science can help conserve this natural resource. Join scientists as we follow water on a journey through a watershed in the Western United States. We’ll adventure from the headwaters in the mountain peaks, through the protective forests, into our cities and countryside, and ultimately to the sea. 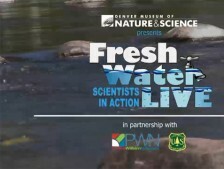 Be a part of this live online webcast and ask your questions to scientists from the USDA Forest Service and Denver Museum of Nature & Science. Learn how you can take action to conserve and protect the water in your hometown.